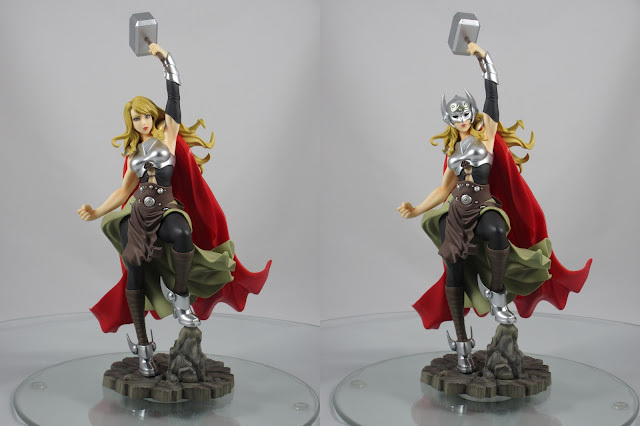 I haven't gotten much into the comic variants in the Kotobukiya Bishoujo line, but after seeing prototype photos of the Lady Thor and Loki combination, I couldn't resist. And now that I have it in hand, I'm definitely glad I preordered! The box art is the usual Bishoujo style, with the window front, concept art on the side, and photos of the statue and accessories on the back. This time the box is quite a bit larger than previous Bishoujos, thanks mostly to the raised arm pose with Mjolnir. The statue also has a bit more weight to it too, due to the base I think. 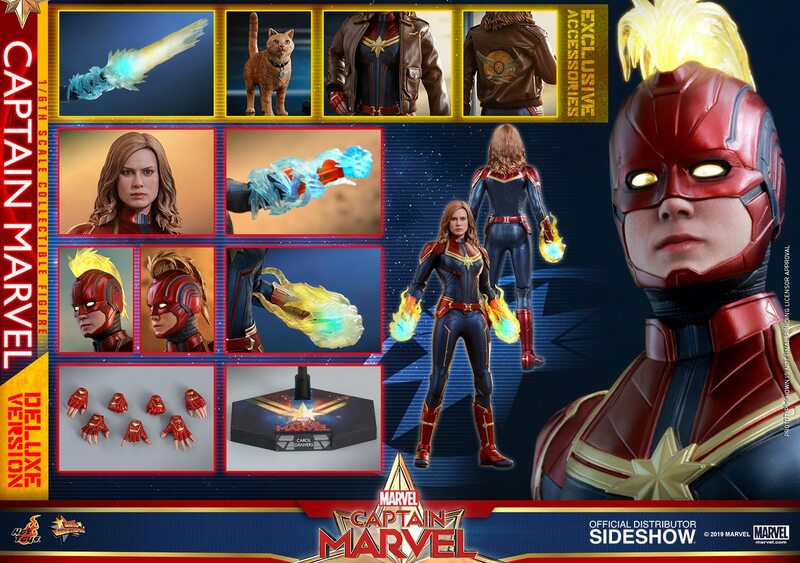 The package comes with both an unmasked sculpt and a masked sculpt. Both are beautifully done, but I always prefer to show off the face with my Bishoujos, so I'll definitely be going with the unmasked version. But either option will look great on display. The pose is powerful, and suits the character perfectly. The paint application throughout is flawless, and I love the details with the metallic silver highlights and chest armour. The flowing cape and flowing skirt also make for a very dynamic combination, and the sculpted detail accented by the paint app show them off to their best effect. The base is very nicely painted, with a dark wash giving the stones a nice realism. The rocky outcrop where she rests her left foot makes for a great pose. The metallic silver on the boots, and the sculpted wraps around her lower legs look great. The unmasked head sculpt has a stern, determined look and coupled with the right fist makes for a very powerful pose. The skin tone, as with all Bishoujos is great, on both the face and arms. I also love the sculpting on the chest armour, and the silver highlights on the corset. The detail underneath those with the tie around her torso looks great. From all angles, I think this Bishoujo looks amazing. Mjolnir is attached through the hand by detaching the handle and sliding it through the grasping hand. It's a bit of a tight fit, but working it gently through will prevent any potential damage. I think all in all, this is one of my favourite Bishoujos, right up there with the three Horror Bishoujos. I cannot wait to get the Lady Loki statue in early 2017 and have these two displayed together. If the detail and paint application on Loki is as good as on this Thor, it'll be a fantastic display combination!